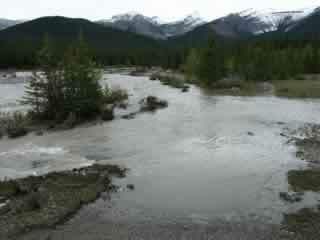 Ten days later Kananaskis was hit with the second “ten-year flood”. Normally these occur once every ten years, not once every ten days. Over 140 mm of rain in two days has the Elbow transformed into a muddy torrent of water once again. Trails are wet, muddy and drowning in puddles of water. 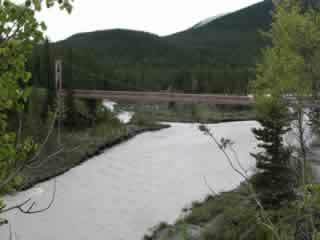 Mudslides and washouts are common. Snow covers the higher elevations. 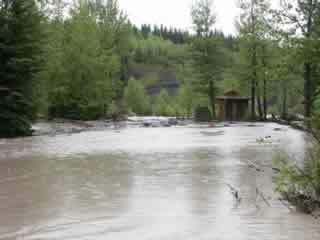 Many Day Use areas are closed, but the Winter Gate at Elbow Falls remains open. These photos were taken during an afternoon tour of the valley. Only a few intrepid souls and a bunch of paddlers were out and about. Click an image to see an enlargement. These stairs normally lead down to a beach that is a couple of metres wide. 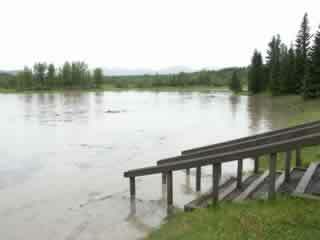 Flooding at Allen Bill Pond was the most dramatic in the entire Elbow Valley. The normally placid water was a fast flowing river with eddies. This is an overview of Allen Bill Pond taken from a hilltop at the west end of the pond. The parking lot is at the top left of the dramatically enlarged pond. This is the Elbow as it leaves the Little Elbow Recreation Area. In the background the snow-covered summit of Banded Peak is shrouded in the clouds. This is the (not so) Little Elbow as it Flows under the footbridge. 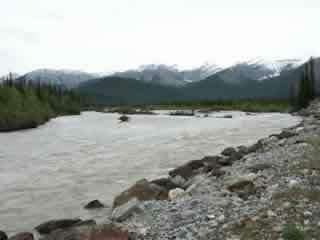 Although the rivers here were swollen, the effects of the flooding was not as great as it was downstream. 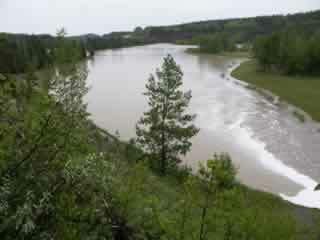 At the bottom, you can see a bit of the Little Elbow Trail, before it became overwhelmed by flooding. The trail continues in the centre-right of the photo. Even at low water, parts of this trail have surrendered to the river. 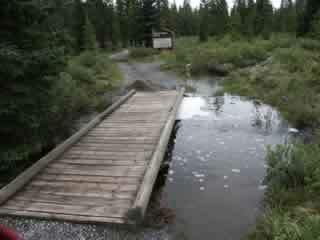 This bridge is strategically placed at the start of the Little Elbow Interpretive trail near the Forgetmenot Day Use Area parking lot. The Forgetmenot Pond seemed to be relatively unaffected. 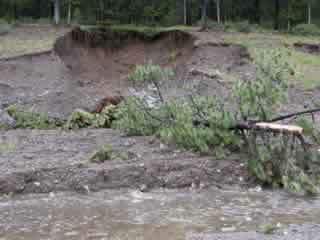 This mudslide took out a chunk of hillside along Hwy 66 near the Rainy Creek pull-out. Caution is advised when walking along the edge of hills and cliffs.